source.png​ (146.9 KB) - added by stib 2 years ago. Are you reporting an issue with the prores encoder or with libswscale? ftp ftp://anonymous@upload.ffmpeg.org timed out, and when I connected with sftp ftp://anonymous@upload.ffmpeg.org it asked for a password and wouldn't take an empty one or 'anonymous'. Anyway the problem still occurs when the source is a png image, so I've attached one. I'm not sure… The problem only occurs when encoding in prores444 codec, using the prores_ks encoder, and with yuva444p10le pixel format. Do any of the following commands allow to reproduce the issue you see? 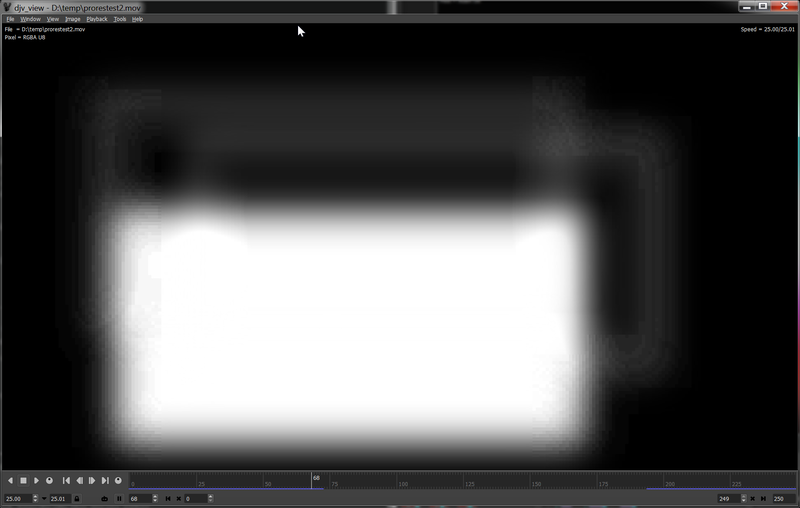 I believe this is an issue specific to the prores encoding to a pixel format with alpha. See this ​thread at Video Stack Exchange. May be related to ticket #3846. Should be fixed in 315f51128a95ca34ac3212c86b2a938330ba6b6e.